Redentore is near the eastern end of La Giudecca, facing the Giudecca Canal and Venice's historic center. 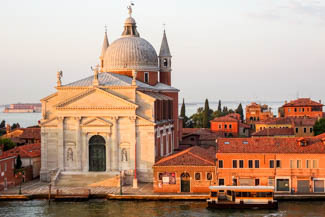 One of Venice's most famous churches, the Chiesa del Santissimo Redentore (a.k.a. Il Redentore), is practically next door to the boat platforms. During the annual Festa del Redentore in July, a temporary pontoon bridge runs across the Giudecca Canal from Venice's Dorsoduro district to the Redentore church.